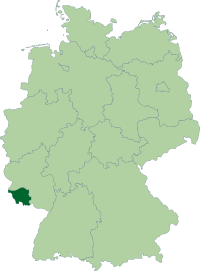 Saarland is a Bundesland (state) of Germany. It has an area of 2,568.45 km2 (991.7 sq mi) and 1,014,000 people living in it (2011). Saarland lies in the south-west of Germany, near the French border near Metz. The capital is Saarbrücken. In 1920, the Treaty of Versailles made Saarland from parts of the Prussian Rhine Province (1,465 km2 (565.6 sq mi)) and the Rhine Palatinate (416 km2 (160.6 sq mi)). The area was put under the control of the League of Nations for 15 years. After a plebiscite (vote) in 1935, Germany got the land back. After World War II the Saarland came under French administration. Saarland was allowed its own government for most things in 1947 but not independence. Germany got the Saarland back in 1957 and it became a Bundesland. In the south is France, in the north-west Luxembourg and in the north and east is Rhineland-Palatinate. Saarland Facts for Kids. Kiddle Encyclopedia.